Some people are naturally skilled at sabotaging plans and finding ways to throw a monkey wrench into the situation. For others it is not only a moral issue, but they aren’t always as skilled at finding ways to get in the way of things. 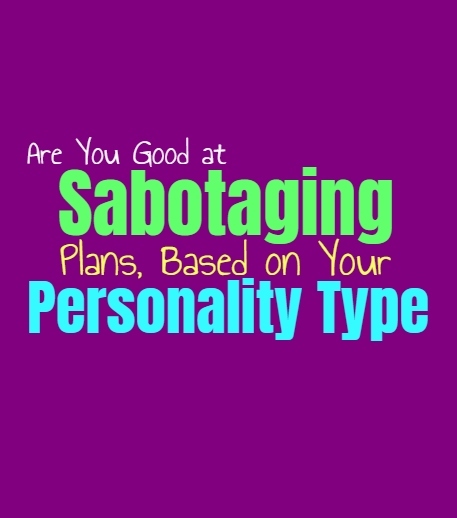 Here is how good you are at sabotaging plans, based on your personality type. INFJs are often great at finding ways to sabotage a situation or even a person’s plans. They are capable of seeing the most likely outcomes, and have strong intuitive abilities. This helps the INFJ find ways to sabotage what someone might be planning, since they can often see through them. INFJs are also capable cooercing people and convincing them of doing certain things, which can be useful if they want to alter someone’s plans. ENFJs are capable of seeing around the corner with most situations, which can make it easy for them to sabotage if they want to. They can often see what is the best way to really interject and thwart someone’s plans. ENFJs are also capable of manipulating people and situations if they see fit. They are skilled at understanding others and are very empathetic people, this is something which helps them uncover more information which might make it easier to sabotage. INFPs don’t often enjoy sabotaging others, but they do have a tendency to sabotage themselves. INFPs are more likely to thwart their own plans and happiness than they are to do this to another person. There might be times when they see that someone is doing something bad or harmful, and so they might try their best to change the situations. INFPs are certainly good at creating distractions, which can sometimes help them to sabotage a plan. ENFPs really aren’t fans of sabotaging without a solid and often moral reason for doing it. They do have a tendency to sabotage themselves, often more than with other people. If the ENFP does seek to sabotage a person or plan, they often do this by finding means of distracting them. They are good at coming up with diversions and ways of keeping someone’s focus elsewhere. ENFPs have a way of getting what they want, since they don’t give up when there is something they are focused on. INTJs are unusually good at sabotaging a situation or plan, since they are problem solvers by nature. They often use their ability to analyze a situation and find the smartest way to work around it. If they need to thwart someone’s plans then they can often be great at doing this. INTJs know how to dig deeper and uncover the truth, which can really help them to sabotage a person or a plan when they feel they must. ENTJs are skilled at sabotaging plans, since they are good at problem solving. ENTJs can often analyze a situation and figure out the smartest means of which they can thwart a plan. They are good at controlling situations, especially when it is important to them. ENTJs can certainly sabotage someone or something if they feel it is necessary. They do this by really analyzing the situation and using the facts to navigate what needs to be done. INTPs are natural problem solvers which certainly helps them when it comes to sabotaging plans. Most of the time they would rather keep to themselves and avoid sticking their nose into other situations, but that doesn’t mean they won’t. INTPs are good at navigating new situations and can often uncover the best to to divert a plan or even deconstruct it. INTPs are also naturally good at sabotaging themselves, even though this isn’t done intentionally. ENTPs are very good at analyzing and uncovering the truth of a situation, which helps them when it comes to sabotaging. They are capable of manipulating a situation since they will work to think about the situation and what the best path would be. ENTPs actually enjoy being able to uncover these different potential paths and outcomes, and so sabotaging can be something they use to adjust a situation in hopes of gaining a certain result. ISTJs would often rather contract plans and focus on building their own lives. They don’t really like having to sabotage something or someone, and would rather work on building something. For the ISTJ taking the time to sabotage something would have to have a very good and valuable reason. They are driven people though, and this sense of focus and strength helps them become capable of many things. ESTJs can certainly sabotage someone or something if they believe it is the right thing for them to do. They can certainly be capable of this, since they are focused and driven people, but ultimately it isn’t something they want to do. For the ESTJ it is better to work on building themselves and their own futures, rather than needing to sabotage someone or something else. For them this feels like a shady way of moving forward, instead ESTJs prefer to just be better. ISFJs don’t like the idea of sabotaging someone or something else, and so they often struggle with this. They might have a hard time in competitive or cutthroat environments, since they don’t want to hurt people. For the ISFJ it feels wrong to have to find ways to sabotage someone just so that they can move forward. They do whatever they can to help make others happy and so the idea of sabotaging can feel harmful for them. ESFJs don’t really like sabotaging others and will often have a hard time doing this. While they are empathetic people and this can help this coerce others, this isn’t something which feels right for the ESFJ most of the time. ESFJs prefer to help their loved ones and those around them, and don’t like doing anything which feels immoral in order to progress in life. For the ESFJ the intent of sabotaging has to be positive in some way, or else it can be difficult for them to do it at all. ISTPs don’t often focus on sabotaging people or plans, since they prefer to just focus on living in the present. Spending time and energy trying to sabotage something can feel a bit pointless for them, and like a waste of their energy. ISTPs want to focus on living in the moment and will seek out the things which excite and challenge them. ESTPs are often problem solvers, and because of this they can certainly be capable of sabotage. They are good at manipulating people as well, which can aid them in this. Most of the time the ESTP prefers to just live in the moment and find the things which excite them. They don’t like getting caught up in things which drain them or cause them to feel stagnant. There might be times when sabotaging a situation is in their best interests, and they can certainly be good at this. ISFPs aren’t fans of sabotaging and really aren’t focused on this type of behavior. For them this can feel a bit too calculated and doesn’t really serve a useful purpose. ISFPs would rather live in the present and focus on the things which bring them joy. They don’t want to feel like they are doing something immoral or harmful, and so they really aren’t that good at sabotaging, nor they want to be. ESFPs don’t really like focusing on their energy on sabotaging someone or something. They prefer to live in the present moment and want to spend their time looking for things which bring them joy. For the ESFP trying to sabotage a situation or plan can feel a bit draining and like a waste of their energy. This doesn’t mean they are not capable of it though, since ESFPs can have a more manipulative side of them when the circumstances do call for it.